Question: What was your purpose for writing the book? Elisabeth Rhyne: The purpose was to attract the private sector to become involved in inclusive finance. Over the last 20 years, microfinance has proven that microfinance is a viable business proposition. I spent most of my career promoting this idea myself. We started with microcredit, provided by a small, close-knit community of institutions. Then, adding savings and turning NGOs into regulated microfinance institutions, we evolved into microfinance. Today, we are taking the next broader step, to financial inclusion—pursuing the proposition that all low-income individuals should have access to a suite of high-quality financial services. I believe that in order for this to happen we need to move from a narrow view of microfinance into one where private sector players have a role and a responsibility. The book uses success stories from private businesses to demonstrate that it is possible for the private sector to engage and be profitable in this underserved, low-income market. It is estimated that the “bottom-of-the-pyramid” market is about $5 trillion. While the cases studies I highlight in the book offer 16 examples of successful private-sector engagement in this market, overall the market is still vastly untapped. Just in Mexico, a middle income country, only 37 percent of households have formal savings, and only 10-20 percent have credit. One other task the book takes on is to create a roadmap for private companies considering getting engaged with inclusive finance. What strategic questions do they need to ask themselves? What do they need to know? Question: There are 16 cases studies in the book. Why did you choose these examples? Elisabeth Rhyne: These 16 cases represent success stories of using innovations, technology, and flexibility to reach out and connect with low-income people. One example is Mexico’s Grupo Elektra and its financing arm, Banco Azteca. Grupo Elektra, the “Wal-Mart of Mexico”, started offering credit to its customers in order to help them finance store purchases. With the creation of Banco Azteca they moved beyond store credit into credit for a variety of client purposes. Today only about 10 percent of credit offered through Azteca is meant for financing store purchases. Banco Azteca may not be everyone’s idea of microfinance, but in reaching millions of low income people with a wide range of conveniently provided services, it offers a serious challenge to microfinance institutions. Another example is Vodafone, through its Kenyan subsidiary Safaricom. Previously, many residents of Nairobi sent money back to their up-country relatives by handing it over to truck drivers. Not very fast and definitely risky. Safaricom’s M-Pesa (“mobile money) program changed all this. Through M-Pesa Kenyan subscribers, even those without a bank account, can make money transfers through mobile phones. Within the first two years of service, over 5 million users subscribed to M-PESA, showing the rest of world just how important the “base-of-the-pyramid” market is and showing banks that the days of traditional banking may just be drawing to a close. Question: So, what are some of the key messages you’d like readers to take away from the book? 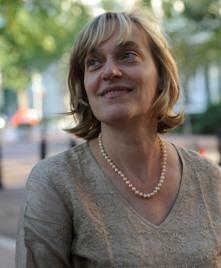 Elisabeth Rhyne: First, that banks are not necessarily the key movers. The real game changers are retailers, telecoms companies and others with new and stronger connections to the underserved, low-income market. And technology companies that bring in lower cost business models, like VISA’s government-benefit distribution programs. Second, companies need to mainstream their efforts to be socially responsible. The most successful examples of private sector entry into inclusive finance come from companies that have made reaching out to low income people a core part of their business, not a small feel-good project. And, third, partnering is often necessary. Few businesses have all the attributes needed to successfully target the low-income market. MFIs are potentially great partners for private sector entrants. They have a deep understanding of the poor, as well as existing customer relationships and distribution networks. 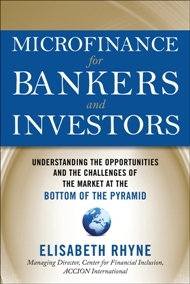 To read more about Microfinance for Bankers and Investors, click here.